To view any image larger, please click on the image. It’s a very difficult time and decision when we have to place our loved ones in the care of others. 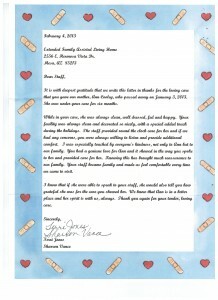 That’s why we were so relieved when we found Extended Family Assisted Living Homes. The care there has been exceptional. My father is comfortable happy and well cared for. I am certain we made the right choice for our whole family. 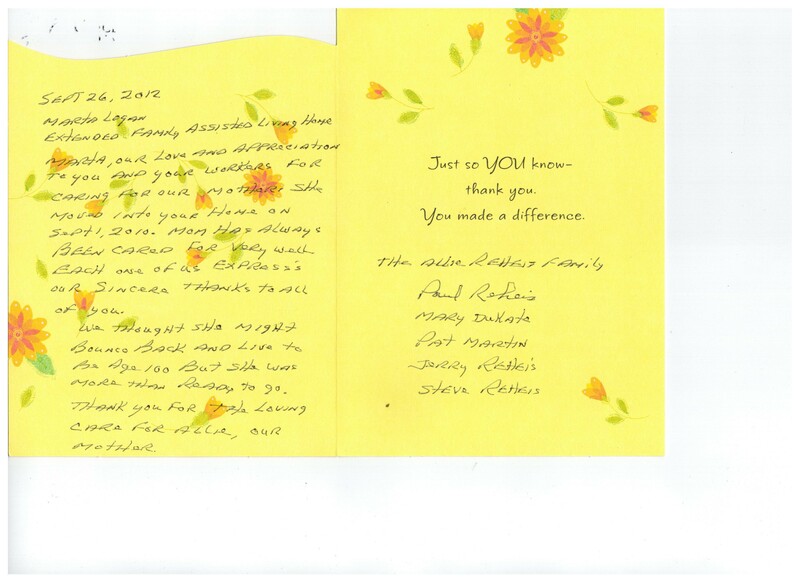 “We were very well pleased with the care that you and your staff at Extended Family Assisted Living gave Velia during the 13 months that she resided with you. She always spoke highly of how wonderfully she was treated, how great the food was and how clean everything was always kept. John and I personally can attest to these facts. As you know, we live in Illinois. During the 13 months that she was with you, we visited her 10 times. 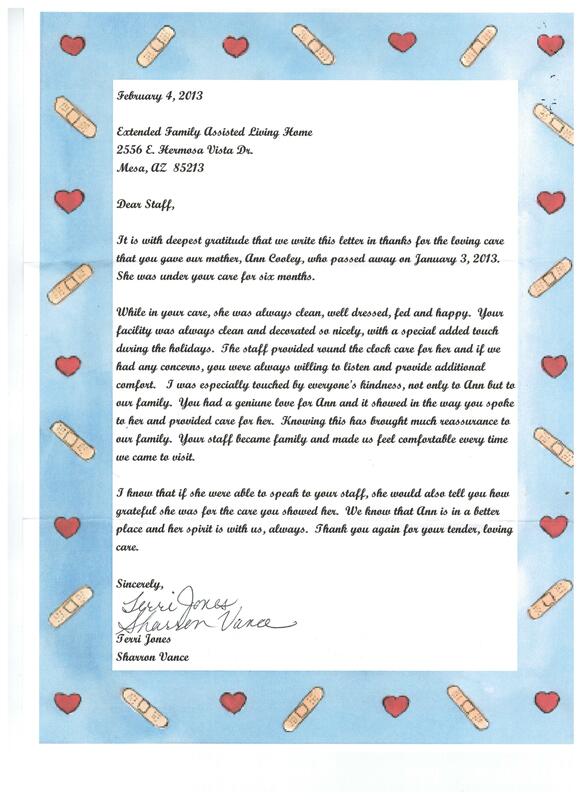 Each time was unannounced to you and your staff, but every time we found comfort in the fact that she had been well cared for, her needs met and the facility was immaculate and welcoming. 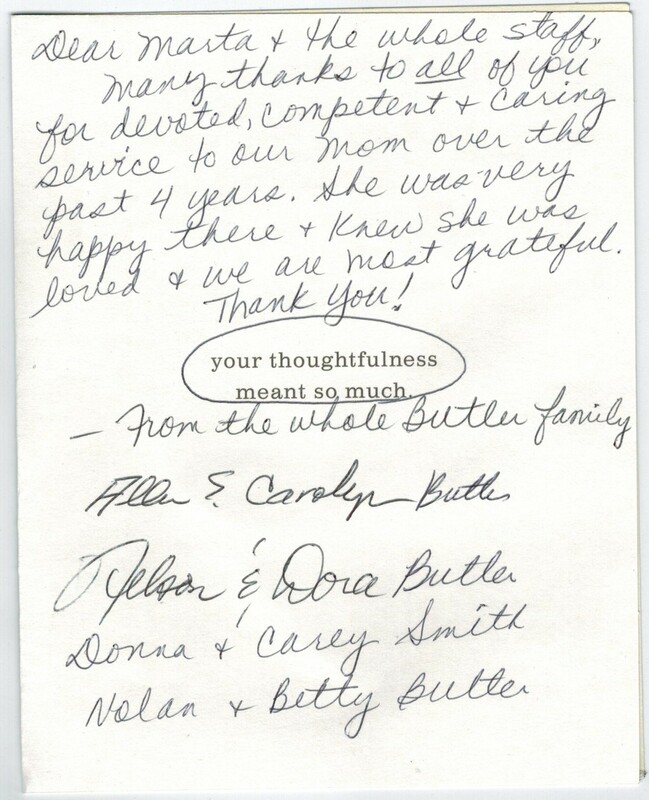 Your staff was always very attentive and that gave us piece of mind living so far away. 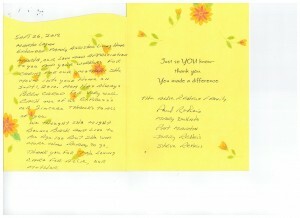 John and I would highly recommend Extended Family Assisted Living based on our experience with you, your staff and home. Thank you for taking such good care of Val. I would like to take this opportunity to thank you for the wonderful care that my mother received at your Extended Family Assisted Living Home on Hermosa Vista Drive in Mesa. Entrusting a loved one to a facility such as yours is no small decision. 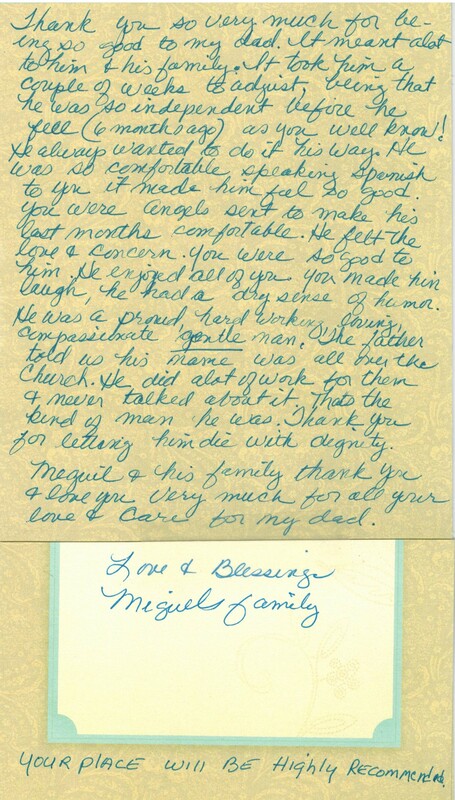 My family and I feel fortunate that our mother was in your care. The staff met all our mother’s needs and more. 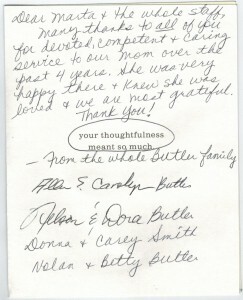 They were very caring, gentle and helpful in seeing to mom’s needs. The facility was well maintained, clean and attractive. Our mother felt very welcome there and we feel fortunate that she spent her final days in such a warm, caring atmosphere. 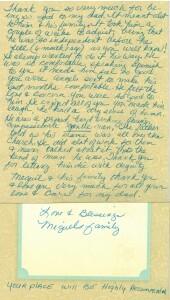 We certainly appreciate everything you did for our mother.